Complete Brush with Aluminum Head, 4" Long Hog's Hair Bristle, Soft Bumper-Gasket and 4 Stainless Steel Screws. This brush comes with a BLACK Bumper Gasket. 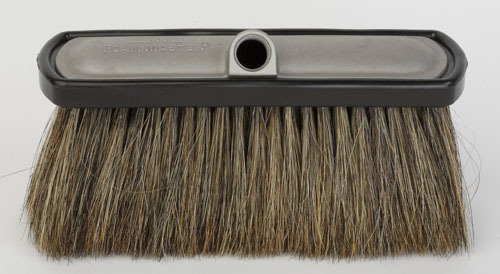 FoamMaster® brushes usually ship within 15 Business days of our receiving your order. If you need faster delivery, please telephone, email or fax us and we will do our best to meet your delivery schedule. Volume discount pricing is available. Price breaks given as noted above. Fill in the number of brushes you wish to purchase in the box next to the BUY button. To add a Handle Locking Device please select Yes from the Handle Locking Device box below. Click this link to see all available handles for this brush.